Dirty Martini Queen's Musings: October is flying by! I have just now caught my breath after a much needed and longed for trip home to Arkansas to see the family and partake in the annual girl's trip with my buddies! I also took place in Amy from Bumble Bee Lane Fall Swap and attended the Merry Mountain Hookers Hookin since I last blogged....whew now you see why I'm so very tired. Oh and I turned another year older while I was away. First off the swap was amazing as usual! Amy has this swapping down to a science and I always get paired up with the greatest partners so this year was no different. As everyone knows "Fall is My Time Of Year" and there is nothing I like any better than Halloween and Fall décor which is evidenced by the fact I know have to decorate in Sept/Oct for Halloween and switch to Fall for November and Thanksgiving because I have too much stuff to possibly even put out at once. Gee hoard much Donna? I have purged, sorted and sold at least half of my collection but still have way to much but I can't help myself. Anyhoo, I was paired with two lovely ladies this time which was an extra special treat for me.....twice as much shopping, crafting and goodies which is just right up my alley. First I swapped with Becky from Ginger Crème Hollow and this gal is mighty talented. She just wowed me with all these goodies. I had a phone issue the day I got my box and lost the pictures but thankfully Becky posted one so I grabbed it. I'll show you in a minute where I put things because you know those kitties went out right away. Becky sent these great magnets made with vintage style designs which I put on my Halloween tree in the living room. They are so cute. Secondly, I swapped with Francine from Primitive Stars and we've paired together a few times so she has my number down pat. Just look at all this goodness and that's not even a great picture. My first hooked mat and it's awesome! And of course those black kitties stole my heart right away. Now here's how I displayed all my goodies right away. And I still have more goodies to put out for next month so my fall swap just keeps on giving. Thank you so much Becky and Francine for the wonderful swap along with your friendship. I promise a longer post later this week about my visit home, girl's trip, hooking and all other things that keep popping into my wee, little, tired brain. 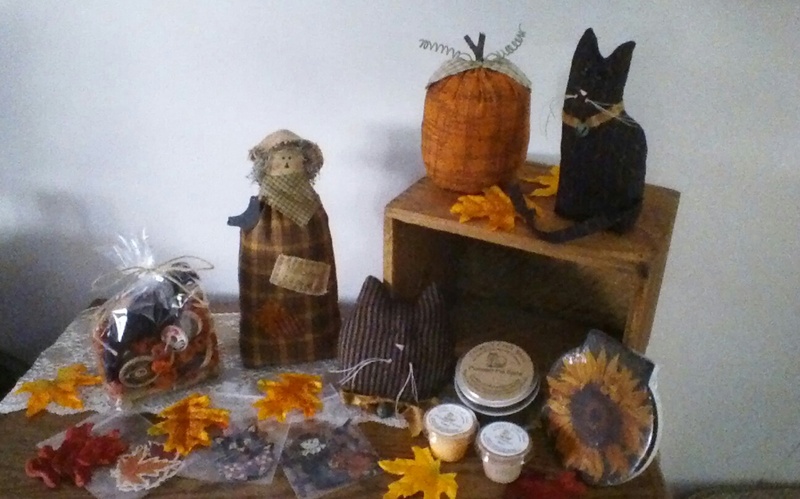 Hello Donna, love the goodies from Becky, love the black kitty's too. Happy you like the swap goodies I sent, everything looks wonderful you decorated with.Hugs Francine. Great swap items! I received swap goodes from Francine in the spring and she does spoil a person.